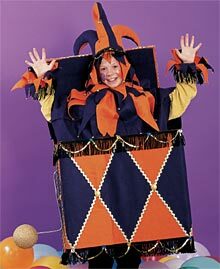 Be the hit of the Halloween parade in this delightful "pop-up" costume! Turn a plain brown box into a unique, almost-no-sew show-stopping hit. Box: Fold in top and bottom pieces and tape to inside box with packing tape. For shoulder straps, cut 2 slits in front box panel. Measure 5" from box top and 8" from left edge. Cut opening wide enough for strap (¼" x ¾"). Cut second opening 2" down from first opening, 7" from top. Repeat on right side of box and back box panel. Cut webbing in half. Thread one end through inside top slit on front left, and feed through bottom slit. Pin end to strap. Attach other end through slits in back panel. Repeat on right side. Adjust straps and pin to fit child's height. If desired, for additional support, apply tape over inside and outside slits. Lid is 22" x 22" piece of cardboard. We used one panel of a second box. For lid top, cut orange felt to size of lid, adding 2" on 3 sides and 5" to the end that meets the body. The 5" end will act as part of the hinge for lid. Adhere orange felt to box lid. Fold edges over 3 sides of lid to inside. Let 5" hinge piece hang. Measure and cut purple felt to fit inside lid with no fold-over pieces. Leave a 5" hinge piece on the bottom as above. Glue purple felt, covering orange felt at the edges. Cover outside box with orange felt, leaving enough to fold over edges to inside. From purple felt, cut large diamond shapes and glue around box and on lid. Glue hinge pieces to back top of box. Secure with pins or clips until glue is completely dry. Glue fringe, sequins, gems, rickrack and more to decorate box; see photo for ideas. Cut 24" x 60" pieces of orange and purple felt. Fold in half lengthwise and cut eight 6" x 12" triangles in each color. Fold should be at wide part of triangles. Approximately ¾" down from fold, stitch a channel. Alternating colors, string triangles through channel with 12" piece of ¼" elastic. Secure elastic on both ends. Pin or use Velcro® brand tape to attach collar around neck. Cut 16" x 60" pieces of orange and purple felt. Fold felt in half lengthwise and cut 10 4" x 7" triangles of each color. Stitch a channel for elastics 3.4" down from fold. String triangles on elastic to fit wrists and ankles. Secure elastic. Embellish tips of triangles with bells or pompoms if desired. Enlarge pattern piece to 200%. Cut 3 pieces of each color felt using pattern. With straight side at bottom and hook (or point) toward the right side, stitch one purple piece (top) to one orange piece (bottom) from "A" to "B" and then to "C."
Stitch remaining 3 sections to one another from "C" to "D."
Cut 24" x 5" piece of purple felt for hat band. Cut 6 4" x 7" triangles of each color (no folds). Stitch triangles to hat band, alternating and overlapping at midpoints. Sew raw edge of band to raw edge of hat, right sides together. (The right side of the band is the side with triangles sewn on it.) Be careful not to sew triangle points into seam. Embellish as desired. Cut one 5' x 3' piece of purple felt. Mark fabric center. Cut hole large enough for head to slip through. Cape should drape inside box to cover straps and box. Bend sculptor's wire to look like a crank handle. Poke hole in side of box and insert wire. Bend wire down and secure in place with tape. Paint Styrofoam® ball gold and attach to handle. Approximate Crafting Time: 6 hrs.